Your clients will enjoy the flavor and fragrance of a fresh roast coffee blend with its intense aroma and timeless intact flavor right in your cup. Our coffee blends are produced to give to your clients the perfect cup of espresso at home or at work. Our coffee beans are packed in metal containers or beans bags to maintain all their fragrance and aroma in time. We offer a wide range of select blends to quench your coffee craving any time of the day. 100% best Arabica coffees from Brazil, Columbia, Honduras, Costa Rica and Peru. • Brazil: “Santos” is a smooth and balanced Brazilian coffee with a clean and fine aroma. A chocolaty flavor, a full body, intense aromas and a persistent finish define its essence. • Columbia: Most Columbian coffees are of the Arabica variety: extremely aromatic and full-bodied defined by hazelnut and flowery finish and fragrance. • Honduras: Balanced and full-bodied coffee with a sweet liquorish fragrance. • Costarica: Excellent coffee with hazelnut-colored crema and a fragrance of apples and dates. Light acidity. • Peru: Delicately structured coffee with a fruity and cocoa finish. The specific roast yields a very rich and textured coffee, full-bodied with a persistent finish of flowers and chocolate. From the careful selection of high quality Arabica coffees from Central and South America, and Robusta Coffee from Uganda and Africa. • Uganda: Most coffees from Uganda are of the Robusta variety with full body and great texture. • Indonesia: A perfect Robusta blend with a smooth flavor and light caramel fragrance. Full and creamy with intense finish. 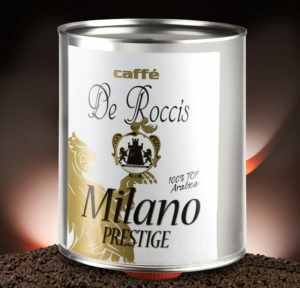 An espresso coffee with a smooth and lasting flavor and a fragrance of hazelnut and chocolate. 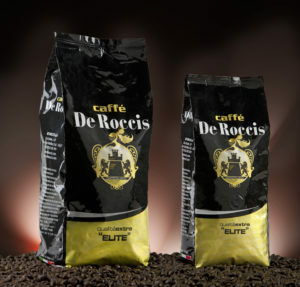 Mildly sweet blend from the best Arabica and Robusta coffees with strong flavor and fragrance. It is indeed the traditional and quintessential Italian Espresso! Brazil : Smooth and well-balanced coffee with pure and fine aroma. A very aromatic blend with a chocolaty finish. 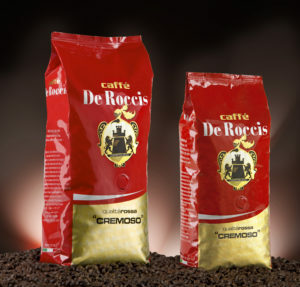 Costa Rica : High quality coffee with a rich hazelnut colored crema and apple and date fragrance. Light acidity. Indonesia : Rich and fine Robusta coffee with a light caramel fragrance ideal even for the most demanding coffee connoisseurs. Full and strong flavor with a persistent finish. Vietnam : Full bodied Robusta, eclectic and distinctive. Colombia : All Columbian coffees are of the Arabica variety with a rich aromatic fragrance, slightly fruity and a wonderful hazelnut and flowery finish. 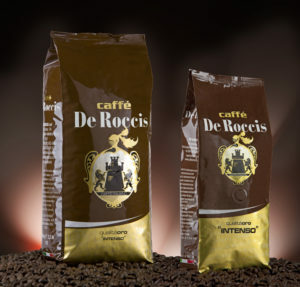 This coffee is the result of the perfect combination of select Arabica and Robusta coffees. Creamy, smooth and velvety, unique and surprising with a sweet flavor and a fruity finish. Classic Italian blend with a very full-bodied and rich flavor. Uganda : Robusta coffee with full and dense body and rich texture. When roasted it reveals a strong and persistent aroma with a nice chocolaty fragrance. 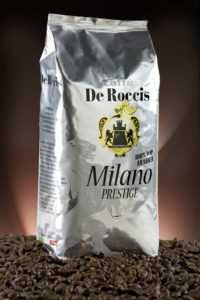 Indonesia : Rich and fine Robusta with a light caramel fragrance, ideal even for the most demanding coffee connoisseurs. A strong and distinctive flavor with a persistent finish. Vietnam : Robust and traditionally full, eclectic and distinctive. Colombia : All coffees from Columbia are of the Arabica variety: extremely aromatic and full-bodied with a superb hazelnut and flowery finish. INTENSO is indeed the most classic and traditional coffee: strong and aggressive with a very full body once in a cup. The roast enhances its unique features and creates a coffee to be enjoyed every day and every hour of the day!